A large late 19th century Walnut centre stool, raised on fluted legs with original porcelain and brass castors. Having a moulded surround and traditionally upholstered in a neutral George Smith linen with deep buttons and brass stud decoration. Superb condition throughout. 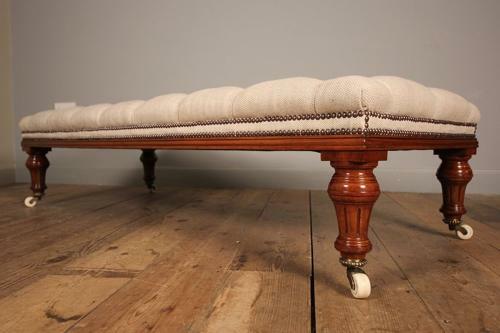 This large long stool would make a wonderful alternative to a coffee table with the addition of a tray. English, Circa 1880.